What it is: Transform the Cleansing ritual into an Art. 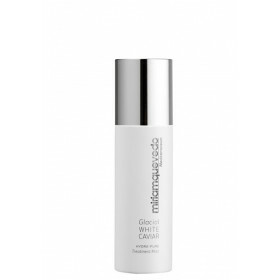 The Glacial White Caviar Toning Lotion is a micellar toner ideal to restore the natural face pH and improve the cleansing process, refreshing and releasing skin tensions and traces of surface impurities, keeping the skin perfectly hydrated, calmed and fresh. What it does: Its formulation of anti-radical action counteracts the environmental aggressions. It has soothing and moisturizing properties thanks to the exquisite blend of pure oils and hyaluronic acid. Enriched with a balancing and protective lipo-amino acid it promotes the detoxifying process and the skin regains its luminosity from the deepest layers. Who it's for: For all skin types: including dry, sensitive, dehydrated, aged or sensitized. - : -	Release the skin from stress, impurities and discomfort. - : -	Keeps the skin perfectly hydrated and incomparably calm and fresh. - : -	Skin recovers all its flexibility. - : -	Balances and protects the ecosystem of the skin. - : -	Soothes the skin and provides antioxidant benefits. - : -	Maintains the balance of the skin pH. -- : -	Boosts energizing effect. Use daily, morning and/or evening either after using Cleanser Crème or on its own. Using a cotton pad soaked in the lotion spread gently around the face using gentle circular massage movements. Continue with the treatment by using The Glacial White Caviar Treatment Mist, The Glacial White Caviar Recovery Serum and The Glacial White Caviar Precious Cream to complete the Ritual. Encapsulated Swiss Glacial Water: High purity. Containing a unique combination of minerals, maintain and retain hydration and energize deeply. Maintains, restores andretains a pure hydration thanks to its technological nano encapsulation. De-Stressing Luxe Complex (PCA Magnesic and Blue and White Lotus Flower extract): It fights against the harmful effects of stress and fatigue, with amazing relaxing properties: defends cell fatigue, inhibit facial tensions with anti-inflammatory properties. Aminoacid Betaine: natural essential component for maintaining water balance; increases miniaturization.